Planning a Herb Garden…50 years ago! I was reading a very old copy of The Times newspaper earlier this week which we brought my partner’s parents on their Golden Wedding Anniversary as a momento of their wedding day. 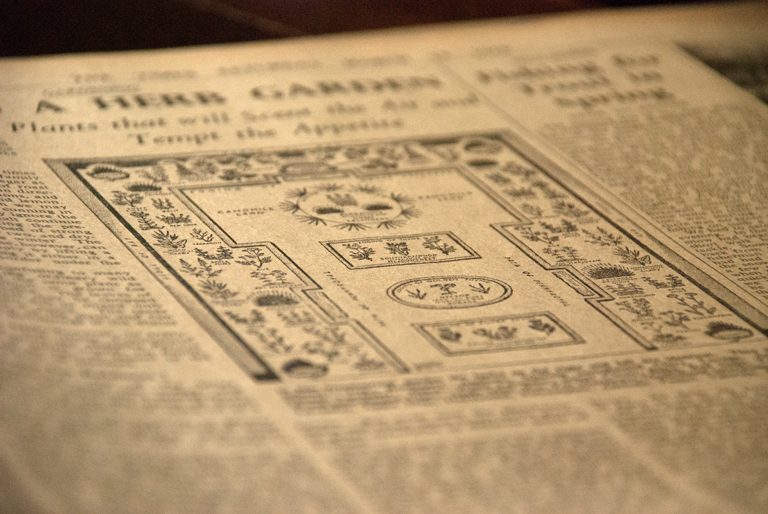 Within the gardening section of the paper there’s an article about planning a herb garden, which it would appear was rather “cutting edge” in the garden sphere at that time. Culinary herbs were used by only the most adventurous cooks it would seem – hard to believe now isn’t it? As it states in the article, at a time when “meat and two veg was the staple diet of most English households” I would imagine that herbs didn’t feature much at all. My great grandfather was a professional chef and I remember my mum telling me that one of her friends, after having pasta for tea one evening at their house, went home and told her mother that she’d had to eat funny food! This also got me thinking about gardening and how different our choices are now in terms of plants, planting styles and design compared to 50 years ago. I remember spending time at my Grandparents house in the summer and the majority of plants in the garden were things like dahlias and bedding plants such as Marigolds, Begonias and Antirrhinums which we particularly loved because you could squeeze the sides of the flowers and pretend they could talk! Most of the gardens I design have low-maintenance planting that really looks after itself for the majority of the year. Generally my clients want to enjoy the garden but just don’t have the time or inclination to spend hours looking after it. Herbs play a big part in the garden now as our taste in food has become more eclectic. It’s easy to incorporate a small herb garden or to grow herbs amongst the other plants. We are also becoming more interested in growing food again – my grandfather’s vegetable patch easily filled up half the garden…we used to pinch the peas when he wasn’t looking, I still love raw fresh peas now! In design terms, I think we are more tuned in to the garden being an extra room to the house and in planting terms we certainly use plants in a different way than they did some 50 years ago. The above plan was available to the readers to buy – I’d love to know how many they sold and whether anyone implemented the plan in their own garden.